A warm hello to all, hoping you are all well. A fortnight ago I left the Kullu Valley behind me and embarked on an epic 2-day journey by jeep over the Himalayan ranges and into the high-altitude desert region of Ladakh. 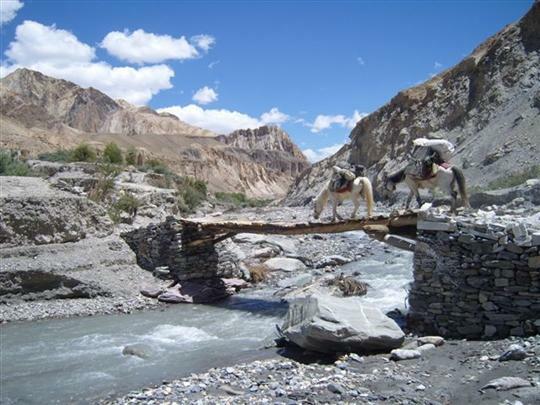 The road to Ladakh crosses the mighty Himalayan range and is filled with a raw and elemental high altitude scenery. This is the world’s 2nd most highest motorable road, reaching an altitude of 5328 meters (I would tackle the worlds highest road in the coming weeks – more on that adventure later). The heights of these ranges create a natural barrier from the consistent rain clouds of the south, and as we progressed the landscape changed from lush green fertile hillsides to rock and dry scrub. For much of the way the only inhabitants we came across were nomads, soldiers and teams of tar covered workers struggling with the never-ending task of patching up a roadway where rain and snow-melt causes recurring landslides and washouts.At one stage, detouring widely around a road closure, we found our back wheels became bogged deeply in the loose sand. Digging the wheels out and laying shale rock underneath gave the tires purchase, and with an almighty team effort we pushed the back end of the jeep until it roared out of that hole only to give us a face-full of sand as it skidded across the loose ground ahead of us. Alas, wiping my eyes and rinsing my mouth was as clean as I would get for those 2 days as our overnight accomodation was in a tent camp on a freezing cold mountain plain with no shower in sight.After 20 hours in the jeep, and while still adjusting to the lack of oxygen at these altitudes, we eventually arrived in Ladakh exhausted to the point where I swear I felt like I walked that entire road, and the sight of the bustling settlement of Leh and it’s many comfortable guesthouses was like heaven. Ladakh is known as ‘the land of the high passes’ and is often also called ‘Little Tibet’ due to its similarities in topography and culture with nearby Tibet. Considered one of the coldest and most elevated inhabited regions of the world, Ladakh’s seasonal climate is one of sharp contrast – experiencing arctic cold in winter (minus 20-30 deg celcius) while the shortlived summer is mostly warm with deceptively strong sunshine (30-35 deg celcius, and believe me, it burns!). To visit Ladakh in winter you either need to be a little insane or seriously tough – luckily, in my quest to escape the monsoon, I have arrived at the peak of summer and it is blue skies all the way! 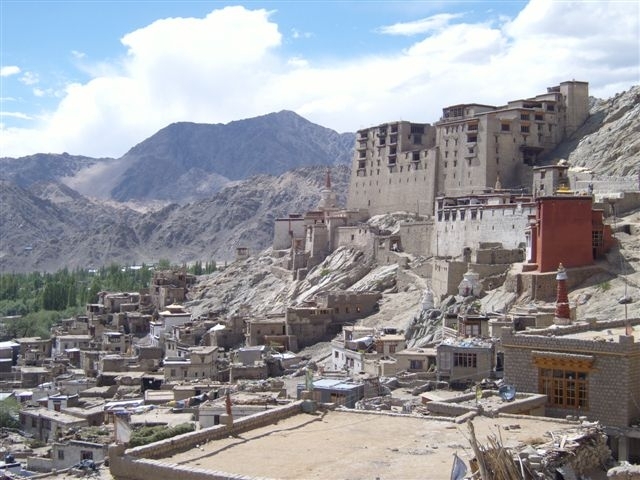 Set in an oasis of richly green irrigated fields and surrounded by huge snowy peaks, Leh, the capital of Ladakh, is a lively and beautiful little town. Towering over the town centre is the nine storeyed ruins of an early 17th century palace that is currently under a very slow restoration. Below, the town is a true maze of little box-like mud brick buildings bristling with brushwood stored on the rooftops for the winter. The colourful main bazaar and open-air refugee markets hold fascinating tiny shops filled with local crafts, curios and artifacts, and keep drawing me back although they are deadly for my budget and my pack is almost near full (I’m still reluctant of sending a package of valuables home through the local post office – believe me, it’s primitive!). Shortly after settling into Leh, by chance I happened to see an Australian friend I had earlier met in the Kullu Valley. He had just undertaken the same long journey the day before me and had met 2 other young Aussies and created a little travel brotherhood. These were good people – wild, adventurous and as uniquely drywitted as only country-bred Aussies can be. I quickly bonded to their group and it was much pleasure that I could once again begin speaking in Australian slang and with the self-deprecating humor that I have found is so often misunderstood outside our culture.Together with a Swiss girl, we organised an expedition with one of the local Tibetan trekking companies, and with a guide, a chef, 7 ponies and their hardworking handler, we headed into the desert valleys for 8 days of mountain climbing and wilderness survival. For much of our trek the trails were fairly easy and we cruised along at a good pace following a small valley stream and enjoying the scenery. Although the mountains of Ladakh are barren, as the sun casts its shadows across their face they become an everchanging myriad of brown, ochre and tan colours. On occasion during our days we would encounter small valley oasis’, with vividly contrasting greenery to the dry valley walls, blooming wildflowers, and barley crops which sustain the hardy local people. Much of the stream water here comes from melting glacial ice and appears quite cloudy, but we weren’t going to let that stop us from having the odd swim.